Where can I use the New Snap-LOC Clips? The New Snap-LOC clips KSL88N for 88mm ModWood decking and the KSL137N for 137mm ModWood were released in October 2018. These Snap-LOC clips can be used in any environment including high corrosion areas except for Bush-Fire rated areas. New design has much wider teeth - gives greater holding power over approximately 32mm in width rather than "single point" holding as with the current ModWood clips. KlevaKlip is a multi-board concealed fixing system, working on a "fixed pitch" principle, that provides consistent gapping of the boards. As each board is inserted into the KlevaKlip, it tightens the previous board, providing significant holding power of the board into the clip. This mechanical holding is supported by the use of adhesive to provide a look, longevity and feel that is difficult to obtain with conventional fastening systems. Where can I see images of Snap-LOC clips and Traditional Metal ModWood Clips? KSL137N - requires two fasteners per board space (8 per clip). KT137 - requires two fasteners per board space (8 per clip). What Joist types are suitable for both KlevaKlip types? What size gap does both KlevaKlip's provide between each of the Deck Boards? Will provide a gap of around 5.5mm. Will provide a gap of around 4.5mm. These gaps may vary over time in different climatic conditions. What dimensions are both types of KlevaKlip's? What heights do both the Klevaklips add to the top of joist? Can I use the Snap-LOC clips with the Traditional metal clips? No, due to the different lengths of the clips they cannot be used together, plus they are also difference heights. How do I calculate how many KlevaKlip's I will require for my deck? 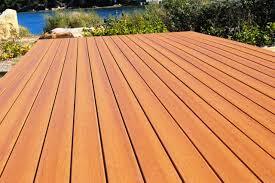 What adhesive is recommended when fixing ModWood deck boards to both types of KlevaKlip Clips? HB Fuller Toolbox Original, Sikaflex 11FC,Selleys 3 in 1. What type of fasteners are required to fix both clips to Timber or Steel joists? 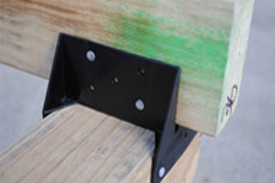 Timber joists use 8 gauge 25- 30mm Button Head Galvanised screws with a head size less than 2mm or Galvanised Connector Nails 32mm x 3.15. Metal joists use 10 gauge 18mm wafer Head galvanised self drilling screws with a head size less than 2mm or equivalents can also be used. 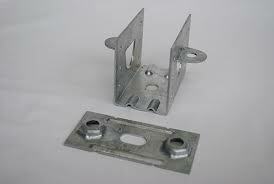 When using Stainless Steel clips, it is essential that you use stainless steel fixings. Use counter-sunk heads if button heads are not available. Whereas it is quite common for privacy screens to have a gap between the boards of 12 - 20mm, the KlevaKlip system provides a maximum gap of just 4.5mm between boards. In a screening situation with the wind behind the screen, such a small gap can effectively cause the screen to act as a "sail". This can generate substantial pressures on the boards/screen - in very strong winds, this pressure can be in excess of 200kg/sqm. Inserting boards into clips at height can be quite awkward, particularly without adequate manpower or stable footing. In a worst case scenario, this can cause significant "tearing" along the side of the board during insertion into the clip, thus significantly reducing the holding power of the clip. The Snap-LOC clip can be used for ceilings or soffits. Our traditional metal clips are not recommended for use in this situation. Can I fix both types of KlevaKlip's directly fixed to concrete or tiled areas? No, Both Snap-LOC and Traditional Metal KlevaKlip's cannot be directly fixed to concrete or tiled surfaces. Battens made from Treated Pine, Steel or aluminium with an absolute minimum of 50mm in height and approximately 50mm in width can be fixed to the concrete or tiled surface to aid ventilation to your deck and substructure. Battens should run in the direction of the fall of the concrete or tiled surface. 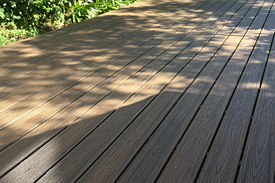 Avoid closing in any sides or ends of your deck to aid further ventilation. Can I use Snap-LOC clips in Bushfire-rated areas? No, Traditional Galvanised Metal clips must be used or if you are in a Coastal area or have a salt or chlorinated swimming pool stainless steel clips must be used. For further details please see Corrosion Resistance document listed below. What type of clips can I use in Coastal regions and around salt or chlorinated swimming pools? The Snap-LOC clip fits all environments. If you are in a Bushfire-rated area Traditional Metal Stainless Steel clips must be used. What areas should I use Snap-LOC, Stainless Steel and Galvanised KlevaKlips? 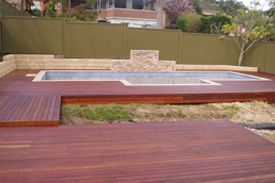 When using137mm x 32mm Modwood Marina Board Natural Grain Collection what type of KlevaKlip can I use? The Snap-LOC clip fits all environments or the KT137S Stainless Steel clip will suit. All KlevaKlip Clips are in Boxes of 40 clips. What are the dimensions and weights of the KlevaKlip Top Fix clip boxes? What type of material is used in the Klevalip's? How can I remove a ModWood Board from the Traditional Metal KlevaKlips? You can remove the boards as long as you have access at one end of the board. You will need to break the adhesive bond between the clip and the board with a stanley knife or similar tool. Next step (2 people preferable) down each side of the board you will see the uprights which hold the board into the clip- You need to prior both uprights apart with a knife, screwdriver or similar tool whilst lifting the board up vertically. You will need to do this at each upright approximately 450mm centres. To replace board clean of the adhesive from the clip, replace adhesive and engage board into clip.